Paper Tracker is designed to track served warrants, as well as document served attempts in the event no one is at the location to serve. It offers the ability to log in from virtually any location that has internet connectivity; office, home, laptop within car/cruiser, etc. Paper Tracker has two modules available. The basic allows the client (subscriber) to maintain and search warrants within that specific office. An additional module may be subscribed to that allows cross searches with other Paper Tracker counties. This feature, IF it is purchased by specified client(s), gives the user the benefit to search and see if a defendant has a warrant in other counties. Users will enter data regarding Defendant, Server, and the case itself. Sheriffs will be able to track served attempts, the officer that served, the time and date the warrant was served, and the location where the warrant was served. One exciting feature of Paper Tracker is Reporting. We have designed a report that can track warrants per office, per server, for ANY time frame searched ~ daily, monthly, etc. This is a printable report with searchable filters to include a specific server or the entire office. It breaks down the type of warrant served, the server name, and then totals ALL warrants together. And, perhaps the most important feature that Paper Tracker offers is the Cover Sheet. When the Sheriff presents cases to the judge, the cover sheet information is vital and can dictate when or if the Sheriff's Office is paid for warrants served. The Cover Sheet is designed to the standards of our beta counties and allows the Judge to quickly see all important information. 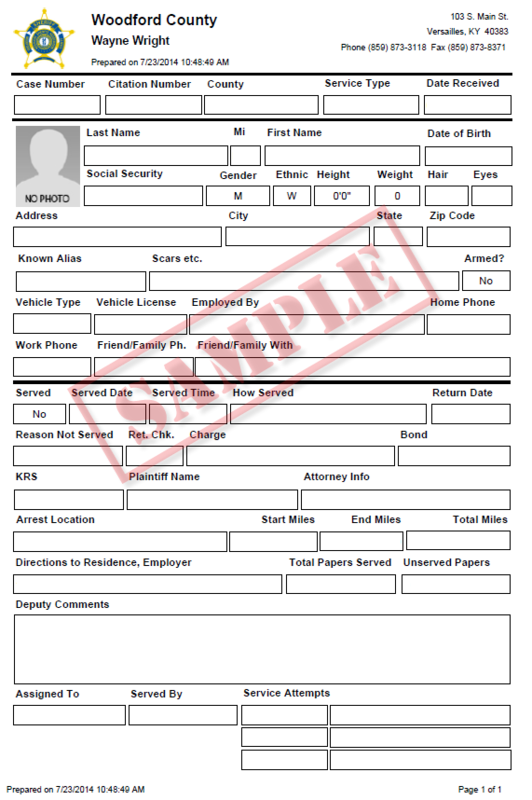 Paper Tracker's Cover Sheet will display the office location, any attempts to serve the warrant, the time and date it was served, which officer served the warrant, and notes. For more information about Paper Tracker, contact us TODAY!